My Life and Activities here in KSA..: World's Largest Man Made..
Perhaps no structure on this list more embodies the original impulse behind the tall building — pure human hubris — than Dubai’s Palm Islands. 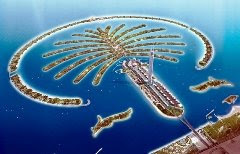 Composed of three separate islands, Palm Jumeirah, Palm Jebel Ali and Palm Deira, the entire construction will add nearly 330 miles of beach front to the city of Dubai. Parts of Palm Jumeirah are currently open for development, with the remaining islands to be completed in the next 10-15 years. When finished, the three islands will contain over 100 luxury hotels while Palm Deira itself will be almost as large as Paris.